The New York Red Bulls have signed defender and Morganville, N.J. native Kevin Politz to a Homegrown Contract. Politz, a product of the Red Bulls Academy, joins the first team after playing four seasons at Wake Forest University. 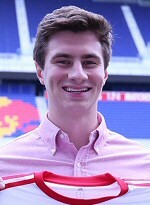 "We are pleased to add Kevin to our club after a successful college career," said Red Bulls Sporting Director Denis Hamlett. "Kevin has earned this opportunity with his play at Wake Forest and with our Under-23 team the last two Summers. He has qualities that we like and look for in center backs, and we look forward to his continued development in our environment." Politz, a center back and senior captain, finished his collegiate career by being named an All-American by the United Soccer Coaches and the ACC Defensive Player of the Year while leading the team to the NCAA Quarterfinals. He anchored a backline that lead the ACC with 10 shutouts and 0.56 goals-against in 2017. "We are really excited to add on another quality Homegrown player to our squad," New York Red Bulls head coach Jesse Marsch said. "Kevin [Politz] has had a great career at Wake Forest both on and off the field, and we are excited for him to continue his career with us." "It is an awesome feeling to be able to sign a Homegrown contract," Politz said. "I have been a part of this organization for almost eight years now. I am truly blessed to sign this Homegrown deal and very excited to get started." During his time with the Red Bulls Academy, Politz won the U.S. Soccer Academy National Championship in 2012 and 2013, and was named to the 2013 NSCAA Youth Boys All-America Team. He has also represented the United States at youth international levels.